The California gun laws are complex and quite easy to violate without realizing it. If you have been charged, you need to have an attorney that you can listen to your side of the story and do what is needed to defend you in the criminal justice system. You should be aware that it is dangerous to discuss your charges with the police or anyone else. What you say could be used against you in court. It is best to have your attorney speak for you. You are urged to contact a San Diego criminal attorney immediately if you are facing weapons charges in San Diego County. A common offense is possession of a firearm without a permit. This is a misdemeanor charge and can result in a sentence of up to a year. It is also illegal to brandish a deadly weapon in a threatening manner. This is a misdemeanor that carries a jail sentence from 30 days up to a year. A more serious offense is felony assault with a deadly weapon carrying a 2 to 4 year sentence. There are defenses to these charges which your attorney will know of and will raise in court. For instance you may be responding to a serious threat from a robber justifying your use of the weapon. Even if you may have made mistakes, you still deserve to have your rights energetically defended in court. Our San Diego criminal defense lawyers at The Law Offices of Top Criminal Defense Law Firms, APLC believe that you are innocent until proven guilty and take seriously our duty to provide vigilant defense of your weapon offenses charges. Our lead attorney Mr. Armstrong has represented many high profile defendants and his litigation has been reported in the news including CNN, NBC Nightly News, Dateline NBC, The Today Show, Inside Edition and the San Diego Union-Tribune. We have helped many clients to successfully resist weapons charges. 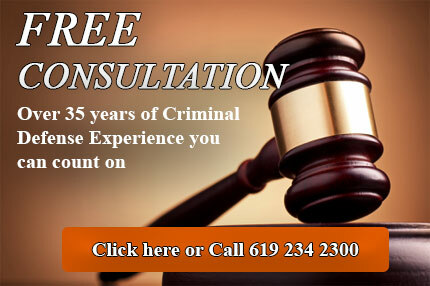 We encourage you to contact us to schedule a free consultation with our defense team.